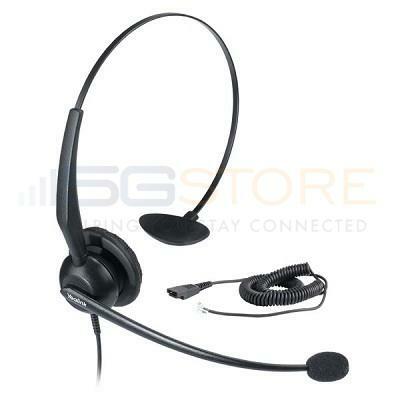 Yealink YHS33 is an over-the-head style headset which is ideal for office workers, SOHO, or call-center staff. It is compatible with the full range of Yealink enterprise IP phones. Its distincitve design is slim and stylish and made from featherweight materials to ensure maximum comfort. The unique pivoting boom mic coupled with wide-band audio technology delivers rich, clear audio and comes with ultra noise-cancelling technology to filter out background noise. The Quick Disconnect feature provides walkaway convenience, enabling users to quick leave for a short time or switch to other equipment. Yealink YHS33 delivers exceptional comfort, durable lifecycle, premium qualit lifecycle, premium quality, and brilliant sound. Does not work with our Polycom VVX410 phones. This headset is for Yealink phones - they will not work with Polycom phones. We have a 30 day return period, please give us a call so we can help you out.